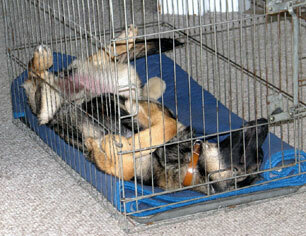 Are you crate training a puppy? Many people have a very negative feeling about crate training in general. But, really when used correctly and in a positive way, crate training is probably one of the best tools that you can use when house training a dog or puppy. I really don't know why people feel that way about dog crates other than the fact that they might feel that putting a puppy in a crate is unkind or mean in some way and maybe even restrictive (well yes, it is supposed to be restrictive, but mean, no). Now I'm sure you have all heard that dogs don't like to use the bathroom in the same place that they sleep or eat. And this is true - to a point while trying to crate training a puppy. But given no other choice, they will do it when they have absolutely no other choice. Can you blame them? And once they get comfortable doing this - well, needless to say it is hard to get them back to the place where this is considered a 'no no" by the dog. So to make the crate training work, you, the master, must use this tool correctly and not use it to reprimand the dog or in any way as any form of punishment. This is the first dog crate rule to never forget and to never break! You will only gets your desired response (puppy/dog does "their business" in a spot you pre-approve and never ever in the crate) if you teach the puppy to accept the crate as a good place, first, when you’re at home to supervise them in the crate and also to enforce certain time limits of being inside the crate. While housetraining your dog or puppy you do want to restrict it's access to your home until it has earned the right to enter certain rooms - especially such rooms as those with carpeting (a terrific spot to pee pee on) - unless you just want a mistake, or two, or ten. But remember, to confine a puppy in a crate all day long while you’re gone to work is not housetraining, and this CAN be considered cruel but it also defeats the purpose of using the crate in the first place and this is not a good way when crate training a puppy. Wait too long to take the puppy out to potty and eventually a small puppy will be unable to hold it's urine or feces. Then the puppy will potty in it's crate just out of necessity. Can you blame it? Imagine if someone locked you up in a box for 8 hours or longer and expected you to hold it! Could you? And once the puppy has learned that it can do this and it loses its natural instinct to separate its potty place from the place where it sleeps and eats - then your efforts at crate training a puppy are all down the tubes. So you need to start them out for only short periods of time in the crate (a minute or two in the beginning) and eventually working them up to longer periods of time. This way, by keeping the puppy in the crate for only a limited amount of time, when you release him you'll need to immediately take him out to your potty area and encourage him "to go". And once he has done his business, take a few minutes to praise him like crazy because this too is a very important part of the process when successfully crate training a puppy. If you do happen to find that the puppy has soiled his crate, make sure that you clean it up thoroughly before returning the puppy to the crate. If you don't you will set back all your house training efforts up to this point. Don't scold him for it, just clean it up and get it ready for the next time you need it. This will show you that you have progressed past what the puppy can really do so back up time wise and do not keep the puppy in the crate as long for the next several crate sessions. If your dog still has problems, even after several crate breaks, if I were you I would restrict his access to the kitchen or bathroom (where this is a slick floor) until you get past this point. Crate training a puppy is different from dog to dog so don't expect this puppy you have now to be crate trained in the same amount of time as any other dog that you might have owned. If I were you, especially with a young puppy, I would suggest that you don’t go longer than an hour and half to two hours at the most for the first several months of its life so that you can consistently reinforce good habits (not soiling the crate) and that by "going potty" in a certain location, not just anywhere, that the puppy will receive plenty of treats, love and fun time outside of the crate. You can also use a food treat as a reinforcement and reward however in many cases your affection and approval is by far the reward that your dog wants the most. Now that you are taking the dog out to potty (even if you have a fenced yard) I would suggest that you don’t roam aimlessly during potty breaks. Give the dog a set time, such as five minutes, to go potty, then take it back inside, whether or not it has "gone to the bathroom". When crate training a puppy this process will teach your dog that while casual walks are just for fun, potty walks are short and purpose filled. Why is this important? Because when your puppy wakes you up at 3 o’clock in the morning and really, really needs to go potty, and the outside temperature is below freezing, it is at that point that you’ll be glad you taught him the "fast potty walk" lesson. And in case you're wondering just how to keep up with crate training times for example when crate training a puppy, in the beginning especially, I would suggest you to keep a log of all the separate times that your dog spends in the crate plus how often you take the dog out for potty breaks. In the beginning, especially when your puppy is very young, you may even need to take the dog out every 45 minutes or so for short potty breaks to make them successful. And if you find that your puppy occasionally makes mistakes, then shorten the amount of time between potty breaks. Next, when you get to the point that this time is working consistently and without mistakes, then you can extend the time by 15-20 minutes. And continue this cycle as your puppy matures. In a few weeks or so you’ll learn your dog and "how to read it" plus you will know how to anticipate the times of day when the puppy most often needs to potty and how long he can wait between bathroom breaks. Lastly, when you are crate training a puppy remember that you don’t want a dog with a full bladder (that has just gotten out of the crate) to get excited or distracted by toys or playing on his way outside to the bathroom spot. Do so at your own risk because it is distractions like this that often result in accidents. Quietly let the puppy out of the crate and as quickly and calmly as possible get a leash on it and take it out. At that point, after completing a successful potty break, you can then give the puppy additional rewards and play time. Following this process faithfully will train the puppy to see that after being confined in a crate and after going potty outside, that he gets to play and have fun with the family, which is another reward in and of itself. Remember, when crate training a puppy that you have to be consistent at all time in the times that you take the puppy out for a potty break and how you treat the puppy after his allotted time in the crate. If your puppy is good in the crate, does his business quickly when you take him out then you need to reward him with praise and a nice play session. In many cases, problems with house training are not the dog or puppies fault, but that of the owner. Take your time, be patient and super consistent and you should be well on your way to having a successfully house trained dog. And by using my favorite tool, the dog crate, crate training your dog will make your efforts much more successful and less stressful for both you and the dog.